This firm’s debt collection process begins with the serving of a demand package. The demand package includes a demand letter, selected documents that support your claim for money owed and due, a certain demand for payment, a stated deadline upon which a lawsuit will be filed if the debt is not resolved, and notice of any legal rights the debtor may be entitled to receive under the Fair Debt Collection Practices Act (FDCPA). William R. Wohlsifer, PA does not use a standard form demand letter. Rather, each demand is drafted by a lawyer to articulate the specific facts and law relevant to your case. Unlike a collection agency, it is our general practice to file suit if and when our stated deadline passes without payment. Of course, if good faith settlement negotiations are ensuing when the deadline approaches, the decision whether to file suit will be made jointly between you, the judgment creditor, and William R. Wohlsifer, PA. At all times William R. Wohlsifer, PA, will keep you, the client, duly informed of the status and progress of this firm’s collection efforts and progress. Most of the debt collection cases we accept are handled on a contingent fee plus costs basis under which you will owe no amount for attorney’s fees unless there is a money recovery. The client is responsible for most costs of collection, such as court filing fees, service of process fees, certified mail, photocopying, private investigator fees, etc., regardless of the outcome of the case. William R. Wohlsifer, PA, will do all it can to keep these costs at a minimum, and will not incur any single reasonable and necessary cost without the client’s prior approval. If there is a recovery, William R. Wohlsifer, PA shall be entitled to a share of that recovery at a percentage set forth in the written Contingent Fee Plus Cost Agreement must be signed prior to commencement of representation. Typically, our pre-suit percentage is 33 1/3% of the gross recovery and our post-suit fee is 40%. However, each representation is analyzed on a case-by-case basis. In some instances where the amount in controversy is high and the chances of recovery appear optimal, the contingent fee may be lowered. In some instances where chances of recovery appear highly problematic, the contingent fee option may not be available, a billable hourly fee agreement may be appropriate. In some cases a hybrid attorney-client fee agreement may be negotiated containing both a reduced contingent fee and a reduced hourly fee component. 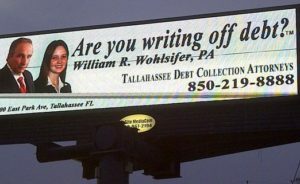 If you are in need of a Florida collection attorney, please do not hesitate to call our office at (850) 219-8888 or email Mr. Wohlsifer at william@infringement-attorney.com. Research shows that the sooner a collection process is engaged, the more likely debt recovery will be.